The accident scene may need to be recreated and witness testimony introduced in order to determine if and to what extent each party contributed to the accident. If you are were not responsible for the accident, an experienced car accident attorney will know exactly how to best defend any claims against the plaintiff for shared blame. A Missouri pedestrian settled their claim for $250,000 after being injured by a small pick-up truck. They were not in a crosswalk and visibility was poor at the time. Even though they shared part of the liability, facts showed that the driver bore the brunt of it. Injuries to a pedestrian vary greatly depending on the height and weight of the vehicle as well as the speed in which it was traveling. Most of the time the initial impact is to an adults lower legs causing the upper body to jerk forward onto the hood and windshield. If the car is traveling at a low speed then the pedestrian will remain on the hood and then drop to the ground when the car stops. Higher speeds mean more contact injuries as the body bounces on the hood of the car. At very high speeds the force of the impact can cause a person to fly over the vehicle causing even more injury as they hit the ground. Head trauma, bone fractures, and lacerations are all common injuries seen with pedestrian accidents. The group with the highest risk of being hit by a car is elementary aged children. Their small size and unpredictable behavior makes them a target for pedestrian accidents. There is a higher duty of care expected in regards to children, and drivers should proceed with a greater degree of caution when in an area where children are known to be. If your child is injured by a motor vehicle retain a Missouri car accident attorney as quickly as possible. Injuries sustained by kids hit by a car may need extensive medical care and long term therapy. 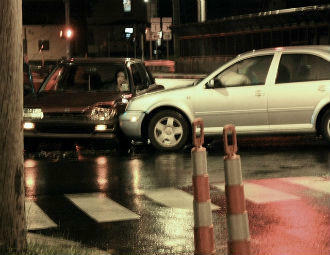 No matter what the circumstance, you should get advice from a St. Louis car accident attorney if you are hit by a car. At The Hoffmann Law Firm we have over 15 years of experience protected the rights of St. Louis car accident victims. If you or a loved one have been injured, as a driver, passenger, or pedestrian, call our law firm at (314) 361-4242 and schedule a free consultation. Hurt in a Car Accident While Working? Being involved in a car accident while on the job opens up an array of complex legal issues. There are many occupations that require an employee to drive their own vehicles as part of their daily workload. Real estate agents for example, who drive out to homes on a regular basis, use their own car and insurance in the scope of their employment. What happens if on the way to an open house, the realtor is rear ended at a red light? Whose insurance company pays for their medical care? If the agent decides to file a claim with her own insurance company, she will probably be denied. Most insurance policies have clauses that do not allow for claims on them if the injury or accident was sustained while you were working. That’s what workman’s compensation is for. Workman’s comp is no fault insurance. Regardless of who is liable, if you are injured while working your employers insurance will be held responsible to pay for your medical expenses and time lost on the job. It typically will not cover your pain and suffering or the damage to your car. The only way to receive compensation for that may be to file a claim against the negligent drivers’ insurance company. The first step to filing a 3rd party claim is to give notice. The sooner the better. Giving notice is as simple as a phone call stating your intent followed by a written letter. Failure to give proper notice in a timely matter could end up costing you your claim. Utilizing the services of a car accident attorney will ensure that all required criteria have been met. Be prepared for the insurance company to fight the claim. They are going to want written statements about the accident, copies of your medical bills and records and the bills to repair your vehicle. Insurance adjustors’ main goal is to save their company money, so it is best advised to refer them to your lawyer if they contact you. One Missouri realtor settled her 3rd party claim with an inattentive driver for $250,000. She sustained neck injuries so severe that she had to undergo surgery to repair cervical discs. Even so she is still in a lot of pain from the accident. While the no fault workman’s comp insurance had paid her medical expenses and her lost wages, they did not take into account her pain and suffering nor decreased quality of life. Being involved in a car accident while on the job opens up an array of complex legal issues. In these instances there are a myriad of ways in which you could miss out on compensation that you should be entitled to. It is best to take your case to a car accident lawyer with prior success in 3rd party claims. Without their help you may lose out on hundreds of thousands of dollars that you are entitled to. To speak with a St. Louis car accident lawyer, call The Hoffmann Law Firm L.L.C. at (314) 361-4242 or contact us online to schedule a free and private consultation. Battling insurance companies can be difficult. They have seemingly endless resources and can wear down their customers until they give up. Insurance companies are required by law to pay financial recovery on all valid claims and to do so in a reasonable amount of time. You have a right to expect that the insurance company will act in good faith and pay your claim after an accident. Unfortunately, this does not always happen. Insurance companies have the incentive to deny claims or minimize payouts to increase their bottom line. This leaves accident victims with few options and hefty costs that they cannot afford. 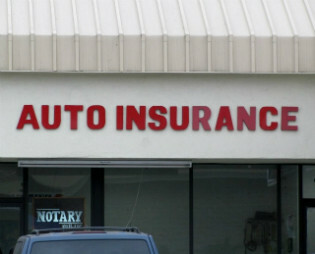 The insurance companies assume that many people will never dispute the claim denial, and many do not. The Hoffmann Law Firm, L.L.C., focuses exclusively on car accident cases in Missouri and Illinois. Attorney Chris Hoffmann has significant experience handling insurance companies that act in bad faith and wrongfully deny claims. Speak to a lawyer at our firm today if your insurance company denied your claim without proper justification or is causing an undue delay in your payout. Battling insurance companies can be difficult. They have seemingly endless resources and can wear down their customers until they give up. The Hoffmann Law Firm knows how to deal with large insurance companies that do not uphold their obligations. St. Louis car accident lawyer Chris Hoffmann will hold your insurance carrier accountable, protect your rights and see that you receive the payout to which you are entitled. You should discuss your situation with Chris Hoffmann today if you feel your insurance carrier is being unfair or unreasonable. You may be entitled to additional compensation beyond what is outlined in your policy. Contact The Hoffmann Law Firm at (314) 361-4242 or fill out our online contact form. There are many costs associated with car accidents. When you are involved in a car accident costs involved often include the cost of medical care, the cost of repairing or replacing your vehicle, and lost wages. But there are many additional costs that can add up very quickly and many people are not aware of some of these expenses until they have been involved in an accident. Some of these costs include personal property you had stored in your vehicle, fees for towing and storing your vehicle, emotional distress, lost earning capacity, costs to hire help to do things you are unable to do due to your injury, permanent disability caused by the accident, any permanent disfigurement. There is a lot to think about. It is important to have a St. Louis lawyerwho has experience with car accident cases. Many states have shorter statutes of limitation, but in Missouri a car accident victim has a period of five years during which to file a claim. While you may have longer to make a claim against an at fault party, the reality is that it is still important to act quickly. It is important for an attorney to be able to protect your claim by gathering evidence and making sure that your injuries and expenses are carefully documented. The more time that passes the harder it can be to get you the full compensation to which you are entitled. There are exceptions to the 5 year statute of limitation. You should discuss your case with an attorney to find out whether these exceptions apply to your case. Settle or file a civil lawsuit? The first course of action is to have a laywer evaluate your case and determine what monetary compensation you should ask for. If you are able to negotiate a settlement with the other party and their insurance company, this would be ideal. But if you are unable to reach a settlement, the next step would be to file a civil lawsuit against that party. In a car accident lawsuit where you are seeking monetary damages you must be able to prove that the other party was negligent. Negligence means that the actions of the other driver did not fulfill their legal responsibility to act in way that would not cause injury. Then you must show that their actions lead to or caused your injuries and that the accident resulted in financial losses for you. Some states have comparative liability laws which allows for all parties to share some of the fault depending on their contributing actions. But Missouri has a tort liability system, which means that when one party is deemed to be at fault, that party or their insurance becomes responsible for all of the damages resulting from the accident. If you have been involved in a car accident and have questions, contact the trusted St. Louis car accident lawyers at The Hoffmann Law Firm. We can evaluate your case and help you to get the compensation you deserve. Call us today at (314) 361-4242 to schedule a free and private consultation. Distracted driving, particularly texting while driving, is often associated with inexperienced, teenage drivers. However, in a recent survey conducted by AT&T almost half of all adults admitted to texting while driving. Contrast this number with 43% of teenagers that text and drive. Interestingly, 98% percent of adults admit they know it is wrong to text while driving and 60% said they were not doing this three years ago. The majority of states are passing laws that restrict all drivers from texting while driving. This is because texting while operating a vehicle has resulted in many reported accidents and even fatalities. Currently Missouri law prohits all drivers 21 or younger from texting while driving. This makes Missouri only 1 of 9 states that has not prohibited everyone, young and old, from texting while behind the wheel. It is important to note, however, that there are many working to change this. In the meantime, there is no question that texting and driving poses a real threat to both drivers and pedestrians. As the numbers show, it is not a matter of knowing that texting and driving is wrong, it is a matter of taking action and choosing not to text while operating a vehicle. Whether you are young or old, it is important to do your part and drive responsibly. Not only does this show respect for other drivers, passengers, and pedestrians, contributing to safer driving conditions, it will also benefit you in that you will be less likely to be involved in an auto related accident. Although you may be a cautious driver, there are still many distracted drivers out on the roads. As a result, you may be involved in a car accident as a result of another driver’s negligence. If you are, it is important to contact a Missouri car accident lawyer right away. It is important to act quick so your lawyer can preserve evidence and build a strong case for you. At The Hoffmann Law Firm we have experience working to get victims of Missouri auto accidents the compensation they deserve. If you have been injured in a Missouri auto accident, call us today at (314) 361-4242 to schedule a free consultation. We will help you hold those responsible for any injuries or expenses you have incurred liable. A 17-year-old boy was arrested in May for reportedly driving over 100 mph causing an accident that injured 10 people. 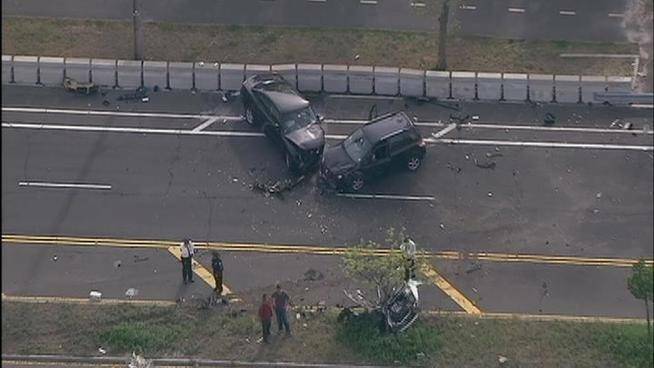 The accident occurred in Queens, NY around 4:30 p.m. on a Friday when the 17-year-old lost control of his Honda, hopping a median and slamming into two oncoming vehicles. As this example clearly illustrates, one negligent driver can cause much harm to other drivers. While it is important that each individual driver does their part to contribute to safer driving conditions, the actions of others are often unpredictible, and may leave you involved in an unavoidable accident. If you or a loved one are injured due to the negligence of another driver, you are entitled to compensation. It is important to act quickly by contacting a car accident lawyer right away to make sure your rights are protected. At The Hoffmann Law Firm we have a strong record of getting victims of Missouri car accidents the compensation they are entitled to. To set up a free and private consultation call us today at (314) 361-4242 or fill out our online contact form. The risk of injury in T-bone and side-impact collisions is higher than many other types of car accidents. Side-impact collisions — also known as T-bone accidents — occur when the front of a vehicle collides with the side of another. T-bone accidents can cause significant damage to vehicles, and they often result in severe injuries to car drivers and their passengers. Speak to an experienced St. Louis T-bone car accident attorney today if you or a loved one was seriously injured in a side-impact collision in Missouri or Illinois. The risk of injury in T-bone and side-impact collisions is higher than many other types of car accidents. One or both cars are typically traveling at a high speed, causing the impacted car to spin or rollover, strike other cars, or strike objects and even nearby pedestrians. Occupants of the impacted car often suffer serious injuries from the side of their car being crushed into them, the car rolling over or subsequent collisions with other cars on the road. This type of accident often occurs as a result of a driver running a red light or failing to stop at a stop sign. This generally happens because the reckless driver is impatient or not paying attention. It may also be the result of a drunk driver. If you have been injured in a car accident due to the negligence or recklessness of another driver, contact The Hoffmann Law Firm, L.L.C. at (314) 361-4242. We have represented car accident injury victims for more than 15 years. We will carefully listen to your situation and immediately begin investigating your claim. We will analyze police reports, medical records and utilize crash reconstruction experts to put forth a strong case aimed at maximizing your compensation. You will not pay attorney fees unless we recover compensation for you. Wearing a seat belt can save your life. It has been proven time and time again, that no matter where you are driving, a seat belt can save your life in a car accident. In fact, according to the National Highway Safety Administration more than 15,000 lives are saved each year in the United States because both drivers and passengers were wearing seat belts when they were involved in a car accident. Rather than placing all stress on one area, a seat bealt spreads the force of a crash over a wide area of the body. “Seat belts help extend the time it takes for you to slow down in a crash,” says Osterhuber. Unquestionably, brain and spinal cord injuries are very serious and potentially deadly. 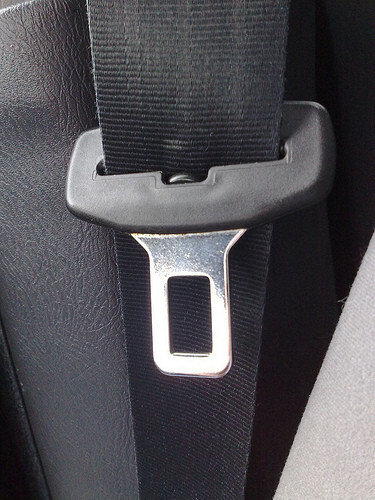 A seat belt is designed to protect these two critical areas. Seat belts can certainly save lives. However, car accidents still occur, and may result in injury or damages. If you are involved in a St. Louis car accident it is important to contact a car accident attorney right away. The Hoffmann Law Firm has a proven track record of successfully handling car accident claims in the St. Louis area. Call (314) 361-4242 today to schedule a free consultation. When you are riding a motorcycle you may feel carefree, but the reality is that in order to stay safe, there are many things you must be aware of. Defensive driving is a must, and motorcyclists must follow the rules of the road just like any other driver. This means not speeding, not cutting other drivers off, tailgating, always signaling, and not weaving in and out of traffic. Any one of these actions can easily lead to a deadly accident. Some motorcyclists can be careless, but most motorcyclists who have been trained properly are attuned to notice everything and everyone on the road with them. Drivers must be warned often to pay attention to motorcyclists and be mindful of them. The stakes are usually not as high for car drivers than they are for motorcyclists. A driver of a car or SUV might be far more concerned with watching out for semi trucks than for motorcycles because semis impose a far greater threat to the smaller vehicles than motorcycles do. But for motorcyclists, careless drivers are the biggest threat to staying safe and alive out on the roads. And driving safely is a responsibility shared by all drivers. Whether or not motorcyclists pose a threat to other drivers, drivers are legally responsible for being aware and diligent in driving defensively and in order to contribute to safe driving conditions. One of the reasons why motorcyclists tend to be more aware of their surroundings than other drivers is that there are more distractions inside an automobile. Distractions like cell phones, eating while driving, or changing a CD, generally do not exist on a motorcycle. You must focus all your attention on the road and operating your motorcycle. The protection that drivers feel their cars give them can be misleading and actually cause them to become more complacent, which then creates conditions that make other drivers and riders less safe. The shared love of motorcycles and awareness gives bikers a feeling of solidarity and brotherhood. Bikers are almost always willing to help each other out and lend a hand if needed. A great goal would be working towards cultivating this feeling of solidarity among all drivers so that anyone out on the road is concerned with the safety of others and puts that safety first. In the meantime, bikers must continue to drive defensively and make their own safety a priority. Depending on the vigilance of other drivers is not always an option, so wearing a helmet is a must. A helmet is one of the few protections that motorcyclists have. In the event of an accident, it is important to remain calm. Motorcyclists stand an increased risk of sustaining serious injuries in the event of an accident. You may need immediate medical attention and therefore might be unable to wait for police, take pictures of the accident, and exchange contact information with witnesses, as would be advised following any accident. But medical attention is crucial and there are still steps you can take to protect your accident claim if you plan to pursue damages. Stay at the scene unless you need immediate medical treatment. Do not discuss the accident with the at-fault driver. Document your injuries and medical treatment. The steps that you take after an accident can either protect the integrity of your motorcycle accident claim, or hurt it. You should contact a motorcycle accident attorney as soon as possible so they can help you to pursue compensatory damages for the injuries and other damages you have suffered as a result of the accident. If you have been involved in a car or motorcycle accident in St. Louis, contact The Hoffmann Law Firm, L.L.C. For over 15 years our law firm has been fighting to protect the rights of auto accident victims in Missouri and Illinois. Who is Liable in Drunk Driving Accidents? Many of us will be participating in celebrations during this upcoming holiday season. It is a joyous time of year to spend precious time with friends and family. While we want to be able to fully enjoy ourselves, it is important to remember toalways drive responsibly. Over 34,000 individuals were arrested for drunk driving in 2012. Do not make yourself part of that 2013 statistic. Statistics show that close to 40% of all vehicle related fatalities involve alcohol. The dangers of driving while intoxicated have been well known for decades, and every state has strict laws in regards to the crime. An intoxicated driver is reckless, and can cause serious injury to other motorists. If you have lost a close family member to a drunk driver, or been hurt by one yourself, contact an attorney immediately. Victims of drunk driving accidents deserve to be compensated for their injuries. During this time, when many people will be hosting parties in their home, and serving alcohol, the question of liability becomes an issue. Missouri law does not allow for a host to be held accountable if a guest consumes alcohol on their property and then decides to drive themselves home. However, the responsible action of a host would be to ensure that each guest has a designated driver and make alternate transportation arrangements for those who do not. In situations where there are minors in the home, it is against the law to knowingly serve them alcohol, but Missouri judges have consistently ruled that an accident resulting from this is not the fault of the homeowner. They are typically responsible only for the furnishing of the alcohol. The minor in question is often fully responsible for its consumption, and it is the consumption that caused the accident, not just being handed a drink. Underage drinking is cited as being the cause of close to 30% of all traffic accident related fatalities each year. If you host a holiday party this year with minors in attendance please do not allow them to drink. 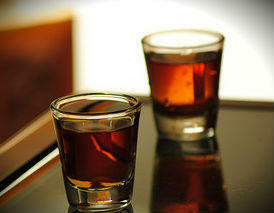 A good deal of celebrating will occur outside of homes this year in establishments that are licensed to serve alcohol. With this license, the owner of the bar may be responsible for certain actions of a patron after they leave his property. This is known as dram shop laws. In Missouri it is illegal for a server to continue providing alcohol to a visibly intoxicated person. If they leave and cause harm to another, the bar can be found partially liable and responsible to pay damages. Case number one is of a young lady broadsided by a drunk driver as he drove away from a private party. No dram shop claim since the homeowners did not hold a license to sell alcohol. Case settled for $546,000. Case number two is a $2.3 million settlement for a family that was hit by a drunk driver after he had left a local bar. Eyewitness testimony and circumstantial evidence as to the extent of his intoxication while he was still being served alcohol makes it a dram shop claim. Wherever you choose to celebrate this holiday season, be sure to drink responsibly. Car accidents and fatalities that can be attributed to excessive alcohol consumption are especially tragic. Hopefully you and your loved ones will be able to avoid such an encounter this holiday season. However, if you are involved in a drunk driving accident, this type of negligence should not go without punishment. Contact The Hoffmann Law Firm, L.L.C. to learn what your legal options are. To schedule a free consultation call (314) 361-4242.